When the TableAdapter class is instantiated, the member variable _connection is equal to null. When the Connection property is accessed, it first checks to see if the _connection member variable has been instantiated. If it has not, the InitConnection method is invoked, which instantiates _connection and sets its ConnectionString property to the connection string value specified from the TableAdapter Configuration wizard s first step. This partial class exposes just one property of the underlying connection object: ConnectionString. If you want to make the entire connection object available beyond the confines of the TableAdapter, you can alternatively change the Connection property s protection level. The auto-generated code we examined in Step 1 showed that the TableAdapter s Connection property is marked as internal, meaning that it can only be accessed by classes in the same assembly. This can be changed, however, via the TableAdapter s ConnectionModifier property. 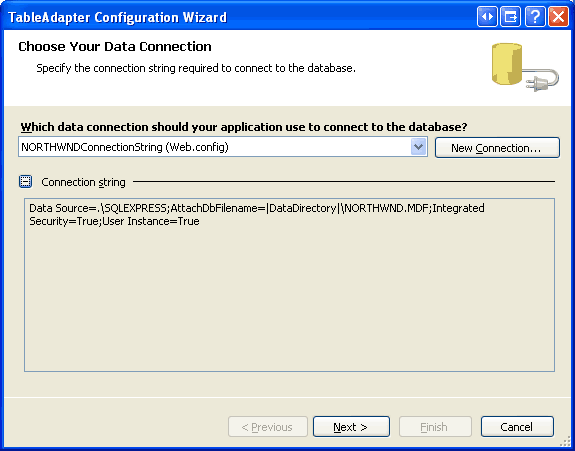 The code for the Adapter and CommandCollection properties closely mimics that of the Connection property. There are member variables that hold the objects used by the properties. The properties get accessors start by checking to see if the corresponding member variable is null. If so, an initialization method is called which creates an instance of the member variable and assigns the core command-related properties. 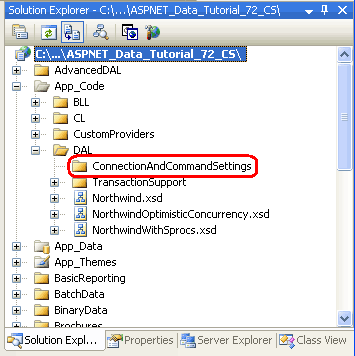 However, there may be times when we need to customize the low-level ADO.NET specifics, such as changing the connection string or the default connection or command timeout values. 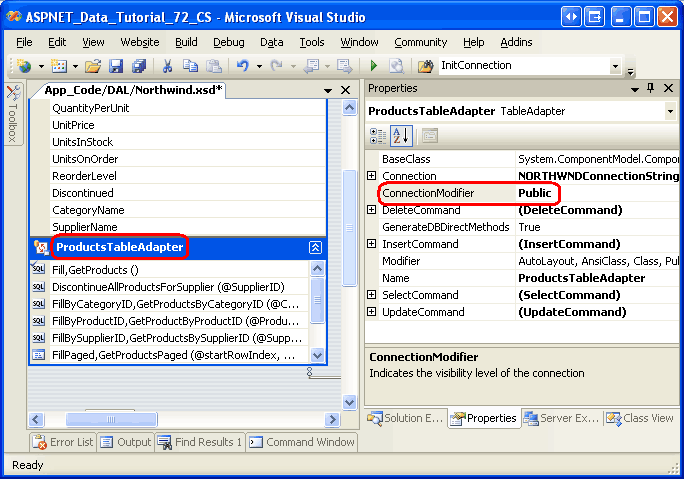 The TableAdapter has auto-generated Connection, Adapter, and CommandCollection properties, but these are either internal or private, by default. This internal information can be exposed by extending the TableAdapter using partial classes to include public methods or properties. 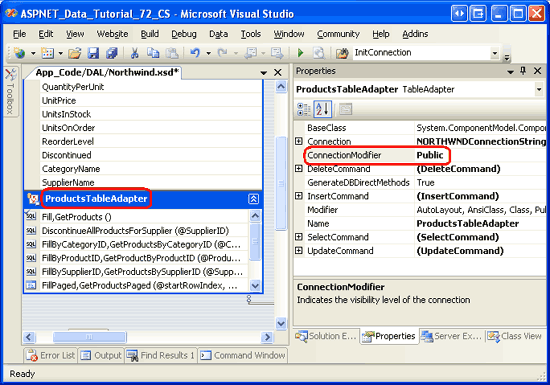 Alternatively, the TableAdapter s Connection property access modifier can be configured through the TableAdapter s ConnectionModifier property.